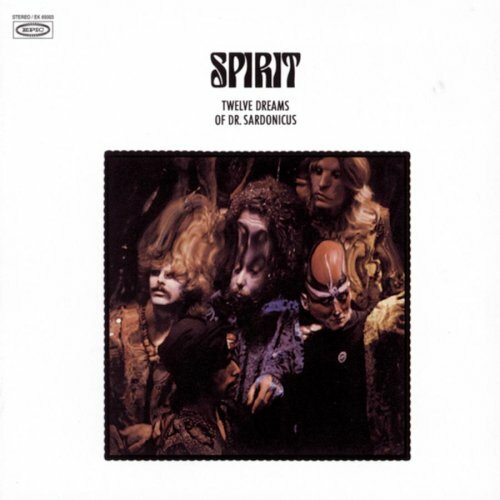 Spirit’s Twelve Dreams of Dr. Sardonicus is one of those albums I have a somewhat different relationship with. Months will go by without listening to it. Once I put it on, though, it’s something I’ll listen to repeatedly for weeks. That’s why it’s earned a permanent place on my iPod. Sadly, the LP may fall into the category of “best albums you never heard.” In fact, it didn’t really gather much attention or traction until 1972, some two years after it was released. And it took until June 18, 1976, some six years after its release, for it to become a gold record. Consider that Olé ELO by the Electric Light Orchestra was certified gold the same day, although it had just been released. None of the songs hit the Top 40. The album never reached the top 50. But there’s tunes off it you’ve likely heard on FM or today’s “oldies” stations. Songs like “Nature’s Way,’ a reflection of the new environmental movement, “Animal Zoo” and “Mr. Skin” gained some play but probably only cultic popularity. Another commonly heard cut is “Morning Will Come,’ the penultimate track. It’s one of my favorite songs, sounding at times like Spirit was parodying the then popular The Grass Roots and saying this is how you play pop music. Twelve Dreams is undoubtedly Spirit’s pinnacle. Yet it’s one of those albums that’s somewhat hard to quantify. Most people refer to it as psychedelic rock. While this somewhat ignores that it was a style that was ebbing away, it’s probably as accurate as any other. If the sound is somewhat electric, it is clearly eclectic. It clearly has a psychedelic feel and lyrics tinged with a bit of the peace and love hangover of the late ’60s. After all, the album opens and closes with the softly sung lyric, “You have the world at your fingertips/No one can make it better than you.” There are rapid, though not necessarily glaring or clashing, shifts in style and tempo. Yet the album is so diverse that while “Mr. Skin” has a funk feel, just two songs later “When I Touch You” is easily a precursor to ballads that would arise in the coming arena rock era. This isn’t a perfect album. It even has flaws within songs themselves that make you wonder why the band would throw something in. But any band that mixes together such a stylistic range and isn’t hesitant to shift rapidly among them is bound to hit an off note here and there. Moreover, even if the songs reveal a tad bit of age today, the production and recording values stand up. Twelve Dreams was, if anything, perhaps ahead of its time acoustically when released. Although the band occasionally falls into sending guitars and sounds from speaker to speaker (the opening of “When I Touch You” has echoes of Hendrix’s “EXP” from Axis: Bold as Love, perhaps not surprising since Spirit co-founder Randy California got his stage name from Hendrix when he played in a band with him in 1966 at age 15), the sound is layered and high-quality. Add how tight the band is and it’s a joy to listen to even today. Some view Twelve Dreams as a concept album, that the 12 cuts on it, many of which flow into each other, represent a night’s dreams by Dr. Sardonicus, whomever he may be. I’ve never really gotten that out of it but whether that was the goal or not is irrelevant. This is an album that was far too overlooked that remains an excellent lesson in rock music and production. Any doubt of that is always erased by the fact that once I start listening to it, it’s damn hard to stop.